Are you ready for the holidays? I sure am. I love everything this season entails - parties, good food, getting together with friends and family, and dressing up. And lucky me, I get to kick off the season with many of you this Saturday at the Canadian Design Bloggers Meetup! As one of the organizers, I am excited to have you attendees enjoy yourselves at this little party that we have put together. But what to wear??? I admit, most days, I dress like a "mom" (minus the mom jeans, lol). Well, for me, figuring out the outfit means a trip to the grocery store. Yup, you heard that right. For you non-Canadians, you're probably not familiar with this hidden gem we have called Joe Fresh, a line of clothing that is sold in Loblaws and Real Canadian Superstores. Created by Joe Mimran, who also created Club Monaco and Caban, Joe Fresh features stylish basics at very reasonable prices. They are my go-to shop for kid's clothes (seriously, kids grow so fast that I don't want to spend a lot of money on their clothes!) and for when I need an inexpensive little basic for an outfit. Tell me, what do you wear when you want to feel a little bit pretty? Do you know I've never been to a Superstore? The girls at my work are always talking about it. I need to check one out! Loving the Joe Fresh style and I would totally be into a Target here in Canada. Looking forward to Saturday, but also not sure what I'm wearing! Glad to hear someone else is still looking...and looking from the perspective of "mom"! Lol. Is Minnesota Candadian enough for the meetup? I'm soooo sad I can't come on saturday ... it's my Greenery day with the girls. We go up to a friend's cottage and cut greenery for our Christmas pots .... really mostly drink and eat!!!! Wish I could be there too... But, have my big Craft Sale to do! -- Anyway, WHATever you wear, I'm sure you'll look FAB! And, good luck with the whole Event! Love love love Joe Fresh. I tried on that plaid dress but it did not look as cute on me as it did on the model! I did pick up the gray tulip skirt though and wore it my first day back to school! I feel pretty in anything flowery or ruffly these days. And bows. I love bows. I'm looking so forward to the meet-up on Saturday and have been trying to figure out what to wear! 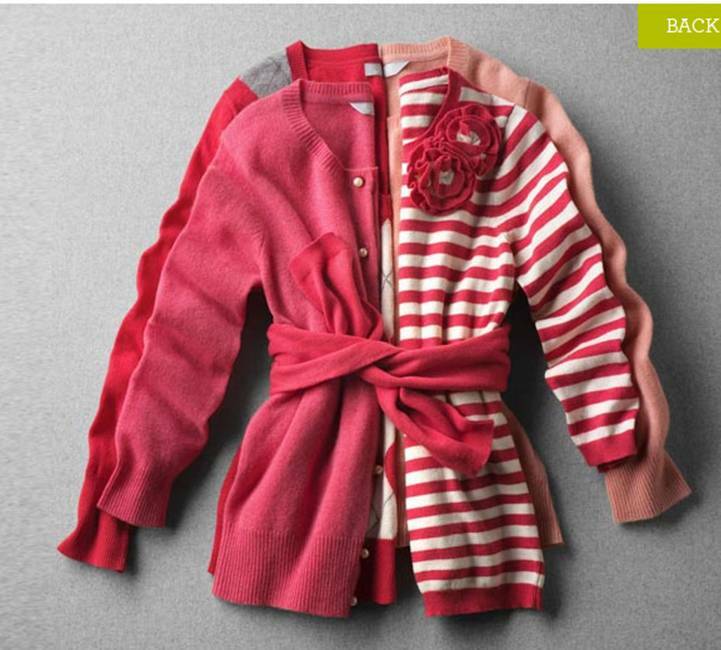 Love Joe Fresh, they have such great pieces at great prices. 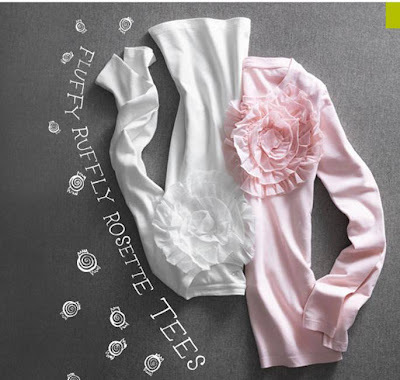 i love those cardigans and rosette tees! wish we had that store here. I DO know Joe! My bestest neighbors who moved away from me and back to Nova Scotia (the wife/mom was from there) dressed their little ones in all things Joe. We even inherited a bunch of their handmedowns before they left. I need to remember to check out their website. And to go up to Vancouver more often! Joe is fabulous! I always end up picking up something while I'm grocery shopping! Looking forward to meeting you on Saturday! I have a sparkly tunic that I can't wait to break out this Christmas! Connie - you must visit Joe! Be warned, their clothes are highly addictive. See you Saturday! Auntie Shan - wish you could be there too! Morgan - I will definitely be wearing some ruffles. I think. jbhat - Vancouver actually has a free-standing Joe store! Worth a trip, maybe? Emilija - I think I buy more clothes now because its so convenient, lol. See you Saturday! Sara - I NEED more sparkles in my wardrobe. Back to Joe, lol. I'm right with you there Jennifer! I am borrowing a tank top from one sister and shoes from another sister for Saturday! It's pretty pathetic. Those outfits are so gorgeous. I think my family would love to wear all those amazing outfits. The color is just so perfect and it looks so comfortable to wear. I so wish I still had access to Joe! I have moved to Paris, and yes I still love the Joe Fresh Style! I'm an at home Mom and find that JFS makes a cool Mom wardrobe accessible to a one-salary household! I can't wait 'til my next trip to Montreal so I can go shopping! what!! love it all~ i love the images with all grey--i am such a fan! and you guys really need a target!! Those look like J Crew! A grocery store? WOW!